For the month of September, this blog will be devoted to VeganMofo. Tune in while I provide short reviews of some of my favorite, and least favorite, vegan cookbooks. If you are new to Libromancy, please check out some of my non-cookbook reviews, such as my review of Pacific by Tom Drury. Alternative Vegan is the type of cookbook that would really be a recipe zine, if passing around recipes zines by hand was still something people did. It’s a 20-something vegan (and restaurant) chef describing the kind of food that he cooks at home at night, like rice and beans, throw-everything-in-the-pot-soup, and roasted potatoes. The only twist is that many of the recipes are not just bachelor food, but Indian bachelor food. The beans and rice here is Venn Pongal and the pickles he presents are Indian pickles. More experienced chefs might not want a cookbook that has a recipe that calls for nothing more than spreading hummus on lavash, but new cooks or cooks working in a constrained space like a dorm might feel relieved to know that there is something that they can make with limited resources. 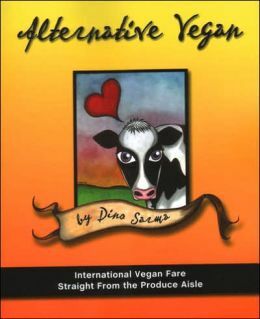 You can preview many of Dino’s recipes at his blog: Alternative Vegan. This entry was posted in Cookbooks, Reviews, VeganMofo and tagged bachelor food, Indian cuisine, vegan. Bookmark the permalink.